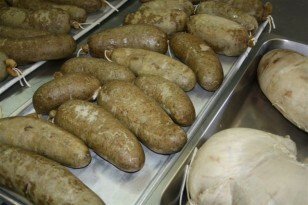 Traditional Scottish Haggis , made in the manner of the great haggises of Skye. Ours are filled into sheep bung casings and range in size from the wee 500g to the banquet size of 2-3 kg. We have them available frozen 12 months of the year. After thawing carefully lower into gently boiling water and simer for 20 mins. Place Haggis on a serving plate and open by slashing lengthwise. Spoon haggis onto boiled taties and neeps. Haggis must be accompanied by the finest single malt whiskey available and enjoyed with steadfast friends.